Locate All Your Workers on a Map and Schedule Based on Location. For a 14-Day Free Trial, click here! Full Featured Planning Software Designed to Manage and Streamline Your Entire Business from Start to End. If you run your own business, you will know the struggle of an endless amount of paperwork and post-it notes dotted around the office paired with sorting through them to manage your business from day to day. Planning your jobs this way can be confusing, tedious and frustrating, however, Eworks Manager has helped companies with just that, especially with our Planning Software. With our Geo Planner map view, you can see a live location stamp of workers out in the field. That way, when your office receives a new job your office staff can quickly see who the closest and next available worker is to that job, and from the same screen assign the job to them. The Geo Planner will also show you each workers' jobs for the day, which means you can plan your jobs more efficiently and economically. By using the Geo Planner to schedule and assign jobs you will save on fuel costs and save time as your workers will only complete jobs off that are proximity to their last appointment and not driving all over town. Our Live Mobile Tracking solution will allow you to plan jobs more efficiently by using the Mobile Tracking feature. From the map view, you can see a live location stamp of all workers out in the field which means you can assign the closest worker to a new job that comes in. The search fields on the map let you search for a specific address which will show you on the map who the closest worker is. This map view displays the worker's journey to each job meaning that if they happen to be traveling to a job and an emergency job comes in that is on the same path, the worker can put their current job on hold and tend to the emergency job quickly. The Mobile Tracking map displays the worker's battery percentage for their device so that the office knows why a worker might not be accepting a job on the mobile App and can quickly assign it to the next closest available worker. 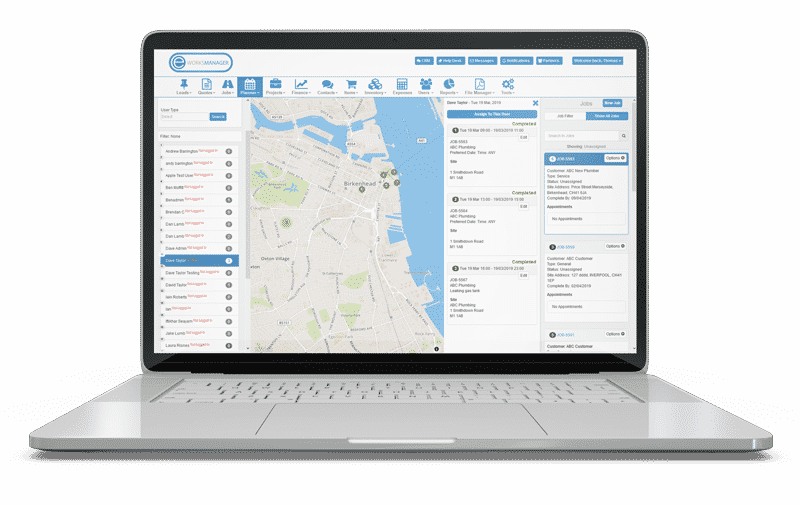 Eworks Vehicle Tracking features as a planning software tool. The map view will display a live location of vans out in the field allowing you to schedule new jobs to the closest available worker. You can also see all appointments booked out for the day for a worker, which lets you know if they have an available time slot to do a job. The various search options will also let you search a specific postcode, showing you a pin drop of the location and the closest worker to it. View all unassigned jobs and with the click of a button you can assign it to one of your workers in the field.